Quico says: It was hard, this weekend, seeing those images of Hugo Chávez celebrating the tenth anniversary of the 1999 Constituent Assembly. Presidential saches and speeches; pomp and (what passes for) circumstance (in the bolivarian republic.) All this public splendor to celebrate the drafting of a constitution that, as Teodoro Petkoff’s bon mot hazs it, reads more and more like a subversive pamphlet, so far removed are its norms from the day-to-day reality of the way power is exercised in Venezuela. Those of us who like to write about the way the constitution is nullified, day-by-day, in Venezuela have something of a long-tail problem: a relatively small number of flashy, highly visible violations (you know the list: the right to private property, the separation of powers, the apolitical nature of the military) grab all the attention, while a much larger constellation of less spectacular outrages barely merit a mention. Call them the B-List Violations: a long list of also-rans in the unconstitutionality stakes. My own impotent outrage typically centers on the almost-entirely-forgotten Article 23. It’s an article of staggering ambition that, for some reason, you almost never hear anything about. Article 23 actually makes international human rights treaties constitutionally binding within Venezuela, as well as directly applicable by all Venezuelan courts. That means that, in theory, you should be able to go up to a Venezuelan judge and cite your rights in, for instance, article 13 of the American Convention on Human Rights (to wit: the right to free expression may not be restricted via indirect means, such as the abuse of official controls on newsprint, on radio frequencies, or of inputs and goods used to broadcast information, in order to impede the free communication of ideas) and that norm is supposed to have constitutional status, superseding any and all Venezuelan legislation on the matter. Taken seriously, Article 23 would revolutionize Venezuelan justice. Somehow, though, TSJ never got the memo. Nor did anyone else. It’s just weird: nobody seems to know about Article 23. You never hear Marta Colomina all huffed up and horrified at its total desuetude. And Prof. Colomina very rarely passes up the chance to get all huffed up and horrified. But it’s there. Article 23 is. Not because aliens from the planet Zorgon put it there. Not because the CIA conspired to sneak it in. It’s there because the 94%-chavista constituent assembly put it there in 1999. You know the one I’m talking about, right? The one Chávez went to commemorate this weekend? That one! Today in TalCual, Miranda State Education Director Juan Maragall focuses on another of these also-rans. Everybody knows that the Constitution says that tenured judges have to earn their seats through “public competitions” – concursos públicos de oposición – where political criteria cannot be taken into consideration. But did you know that, according to article 104, the same thing applies to schoolteachers? Few outside the profession know that…nor should they, as article 104 has become another serial dust-gatherers. In practice the main qualification you need to get a nice, steady job warping the minds of small children is a PSUV membership card. Of course, if you’re accepted into the profession without a concurso you don’t get tenure. You can only be taken on as a substitute or interim teacher, meaning you can be fired by the Education Ministry at any time and for any reason, or no reason at all. Totally exposed, you end up becoming a kind of lower-court-judge-of-the-classroom: at all times, you are one-insufficiently-chavista-remark away from seeing your livelihood vanish. In Maragall’s phrase, the practice of appointing most teachers as interim or substitutes has started to spawn its own juridical framework: recent Education Ministry resolutions make it a prerequisite to have entered the profession as a sub, or as an interim teacher – that is, discretionally – before you can even go to concurso. So, the status quo is that you can now only opt for tenure if you’ve been picked discresionally, a dedo, without your credentials ever having been evaluated in open competition. That’s how easy it is to upend the Venezuelan constitution. No need to bother with referendums or amendments or reforms or any of that jazz. An education ministry resolution does the job. It’d be an interesting, if somewhat morbid, exercise to go through all 350 articles of the 1999 constitution and try to figure out precisely how many have been subverted like this, sotto voce, without anyone much talking about it or acknowledging it out loud or even quite realizing that it’s happened. And amid all this, VTV forces us to watch Chávez celebrating the tenth anniversary of…of what, exactly? It’s never been clear to me. Over time, I’ve come to see the 1999 Assembly as one of the most bizarrely nonsensical public spectacles in these ten years of intensely bizarre public spectacle. 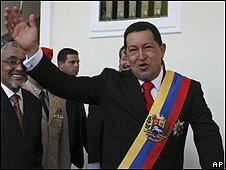 The best way I can make sense of it is that for Chávez, the constitution is a fetish. Not in the contemporary, sexual sense of the term, but in the older anthropological one: a kind of amulet, a magical thing whose powers are embodied in its physicality, in its life as object, and are quite independent of anything actually written inside. It’s the little book itself that interests Chávez, the physical embodiment of his claim to legitimacy. But his claim, ultimately, is mystical rather than legal – based on a metaphysical consubstantiation of leader and pueblo that cannot be mediated through anything so humdrum as a set of formal legal rules. And so the little blue book came to be used as a kind of magic charm, waved around in inverse proportion to how often it was actually read, much less interpreted or – heaven forbid – applied. In the end, reading the constitution – taking it seriously as text – is a profoundly counterrevolutionary thing to do. It can only lead to the kind of apostasy you keep finding in this blog – hell, earlier in this post, even – where an interpretative discourse is developed to compare the legal standard set out in the text to the reality instantiated day-to-day by those who wield power in Venezuela. Discourses like those are inherently destabilizing to a regime like Chávez’s. They insert human intelligence where it is least wanted, least tolerable, most dangerous. When you take the constitution seriously as text, when you set out to interpret it rationally, you interpose yourself between the caudillo and the masses, limiting and qualifying his claim to authority over them. To do so is to meddle in the mystical link between them. And chavismo cannot put up with such an affront: it needs to silence it. Because, in the end, to read the constitution with fresh eyes is as close to apostasy as you can come in the secular religion that is chavismo.